I’ve been asking myself these questions - why do I remain so drawn to the story of Demeter and Persephone? Why do I need to imagine myself walking the Sacred Path as an initiate, and experiencing the full glory of the Eleusinian Mysteries? And why do I feel stuck at the threshold of accepting the power of the sacred feminine? I can appreciate the bond between mothers and daughters. And I can visualize the path to spirituality. I can even walk with courage through the unknown. But I don’t feel the connection to feminine power in my soul. It’s easy and familiar to blame my sense of separation on the patriarchy, and on the men who have caused me harm. But now, with the story of Demeter and Persephone, I find myself troubled by a more difficult and more sensitive truth - Mothers can play a part in this too. Mothers are supposed to protect their daughters, as Demeter did. Indeed, they are driven through all sorts of danger, chaos and madness to do so. But what if they choose not to? What if our mothers turn the other cheek? Wouldn't that disconnect us from our power as well? What if Demeter had chosen to let go of Persephone? She would’ve become just another sacrificial character in just another male-dominated tale. There would be no reunion, no synchronicities of powers, and no epistrophe. No recrossing the threshold to return to a more joyous and whole life. I believe many of the women in my mother’s generation have held their tongues when they should’ve spoken up for their daughters. They’ve allowed us to fall, often repeatedly, and looked the other way. They’ve done this to maintain the peace with the patriarchal men and women who govern their world. And instead of acting like Demeter, too many mothers have acted like Herodias, when she sold out her daughter Salome' in order to maintain a sense of power and control when things were collapsing. 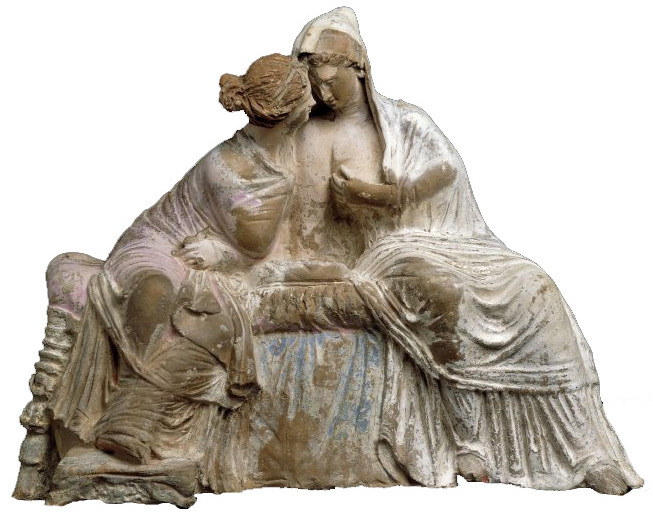 Salome' and Persephone both faced objectified sexualization at a very young age. But Persephone had her mother, and the full power of the sacred feminine protecting her, so she was triumphant in her journey. On the other hand, Salome' was left on her own, stuck in a cycle, repeating the trauma that was cast upon her. Persephone's triumph lay in her ability to reclaim her power as a woman and integrate it with her sexualized self. She added a new dimension to feminine power. I would even say that because of receiving her mother’s support through her trial, Persephone was able to raise the appreciation of the feminine divine to a new level. Perhaps it’s not just me who needs to walk the Sacred Path of the Eleusinian Mysteries. Perhaps we all do. Mothers, daughters, and willing men. As a people, we need to reconnect with the power of the feminine. We need to name what is wrong, and atone for our misjudgments and ignorance, and then we can purify our values, together. But this isn't easy. Even Demeter hesitated at the threshold of her quest. What was it that gave her the clarity and sense of purpose she needed to finally cross through? Turns out it wasn’t a what, but a who - It was Baubo who best reflected the kindness, frankness, and humored sense of purpose that best suited Demeter’s needs. I believe we all need a Baubo to walk by our sides as we prepare for our vision of a more joyous and balanced world. 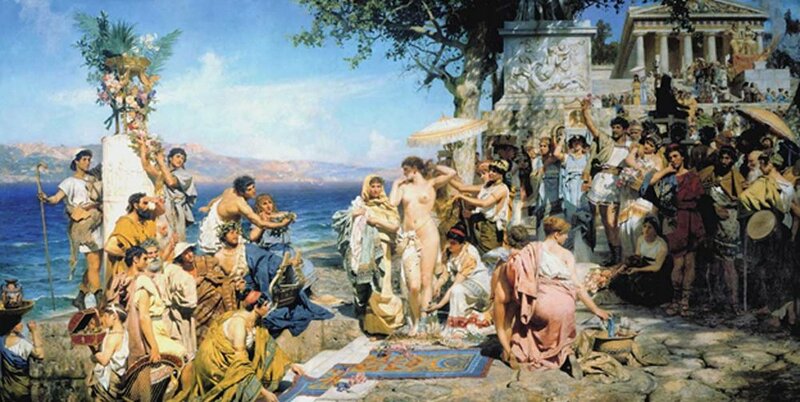 We need to feel connected to each other before we can experience the high point of the eleusinian rites - the Epopteia, a state of having seen. Maybe this is the key. In order to regain our power as women collectively, maybe we not only need to have Baubos pave the way with lovingkindness and bawdy humor, but also have our ancestors by our side. For the truth is that it’s not our mothers' fault that women have largely fallen off the path that Demeter blazed on our behalf. Our falling has been happening for centuries, and we need to recognize our fall together, without placing individual blame. When our mothers have acted more like Herodias instead of Demeter, perhaps it’s more important to open their eyes to the losses created by their choices, than it is to seek punishment for their poor judgment. The tasks of crossing thresholds and redefining boundaries are difficult, even for the Gods. So imagine how difficult these tasks might be for us. If women today are more like a collective of young Persephones, yet we also need to summon the Demeter in ourselves, in order to help ourselves... Wow, that's a lot to ask, but I think we need to become both, at least for a while. And after we have integrated the Demeter-Persphones in ourselves, then we can forgive our mothers who have fallen. There was a time when women held their rightful power, and if we look back far enough in our collective history, maybe we will find this in our Hekates - in our grandmothers, or great-great grandmothers, or especially in our ancient goddesses. We need to rejoin the women who held their own, for they are best suited to sooth the souls of our fallen mothers, at the same time as they show us the way to restore ourselves and embody our power.